Pinksen WordPress Theme is a 2 columns fixed width WordPress template with footer widgets by MagPress.com. 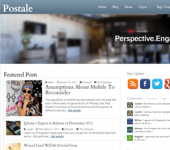 This WP theme also has theme options, featured content slider, featured categories, Adsense ready and many more. I love this theme! I purchased the developers package so I could get rid of the banners and Ronald helped me out so much! He replied right away and even went in and fixed the problems I was having (BTW coding is ALL new to me) I will recommend and buy more themes from Ronald! Thank you so much! !